If you have chosen to stay in one of our excellent self-catering apartments in the city you will need to know where to purchase your food and household essentials during your holiday. Like any other European capital city, Amsterdam has several major supermarkets as well as some excellent street markets to explore. Amsterdammers frequently make two or three trips to the shops each week. This is partly because most people travel by bicycle and there is a limit to how much you can physically carry in your basket and saddle bags. A rucksack is a useful item to bring to the shops with you and will save you having to purchase expensive and unnecessary plastic bags from the cashier. The main supermarkets in Amsterdam and the Netherlands are Albert Heijn, Dirk, Aldi, Lidl, Vomar and C1000. As with all supermarkets in Amsterdam, they are much smaller than supermarkets in the rest of the world, mainly due to the lack of space in the city. Albert Heijn – This is by far the most expensive but also the most convenient supermarket in the city since there are over 60 stores in Amsterdam alone with a large number spread throughout the city centre. Their blanket coverage means you will never be far away from one of their stores. The largest branches can be found at the rear of Dam Square’s Royal Palace at Nieuwezijds Voorburgwal 226 as well as Jodenbreestraat 21 running parallel to the Waterlooplein Flea Market south of Nieuwmarkt. You will find a fairly broad range of products in these larger stores but expect a massively reduced selection in the smaller outlets and the tiny ‘To Go’ stores. Alcohol is also available in the larger stores but again the selection is fairly limited to basic beers and wines. Most stores close at 22.00 daily however one branch in Central Station is open until 00.00 which is always good to know for life’s little emergencies. Whilst Albert Heijn is certainly the most expensive supermarket in general it does have a selection of cheaper economy products. Look out for the red and white ‘Euroshopper’ line of food, drink and essential household items. Also Albert Heijn runs weekly special offers that enable customers to get discounts on many items as well as the popular ‘Hamster Week’ when you are able to get a second or third item free. Be warned however, you must be in possession of an Albert Heijn discount loyalty card or key ring when you pay for your items to qualify. Don’t worry – just ask a cashier for one when you enter the store, there’s no fee and it will save you potentially a lot of money. Check their website for offer details and shop locations. Gall & Gall – If you are looking for alcohol other than basic beer or wine then head to this, the city’s major chain-store off-licence. Commonly these outlets are often located next door to Albert Heijn stores as is the case at Jodenbreestraat 23 and Haarlemmerdijk77-79. Check their website for other store locations. Aldi and Lidl – As in the UK, Aldi and Lidl are recognised economy stores in the Netherlands. Selling a broad range of international products at cheaper prices than the likes of Albert Heijn, they remain very popular with Amsterdam locals. The most central stores are Aldi at Nieuwe Weteringstraat 24-28 on the edge of the Canal Belt and Lidl at Tweede Helmersstraat 29, just a short walk from the popular Leidseplein. Check their website for offers and other locations: Aldi and Lidl. Jumbo, Vomar and Dirk – They have considerably fewer branches around the city centre but do offer a slightly cheaper selection of food. The largest stores in the city centre are probably Dirk van den Broek at Marie Heinekenplein 25 and Bilderdijkstraat 126, Jumbo at Oostelijke Handelskade 1005-1007 and Vomar at Kinkerstraat 34. If you need to hunt out stores local to your apartment check out the following websites and click on the ‘Winkels’ or ‘Filiaal-zoeker’ buttons which mean ‘shops’ and ‘branch finder’ in Dutch. Simply type in the name ‘Amsterdam’ and hit the search button. Move the maps around to locate the nearest store. Dirk, Jumbo and Vomar. EkoPlaza and Marqt – If you are in search of health foods and organic produce then check out one of the many branches of EkoPlaza around the city centre. One of the most central stores can be found alongside the Waterlooplein Flea Market at Waterlooplein 131. Check their website for other stores. A second popular health food store in the city is called Marqt and is located just a few minutes’ walk from the Leidseplein at Overtoom 409. You can read more about their food selection and other stores at Marqt. Amsterdam prides itself on its broad selection of street markets. Many locations rotate the kind of goods on sale daily. The main central markets selling food are as follows. Albert Cuyp Market – This impressive street market is open daily and stretches what seems like miles from west to east along Albert Cuypstraat. Located in the Pijp district close to Museum Square and the Heineken Experience it is easily accessible to visitors to the city. This is Holland’s most popular market attracting over 20,000 visitors every day. Plenty of fresh fruit and vegetables and preserved food products can be found on sale here as well as plants, fabrics, jewellery and clothing. You can find more information about the market here. Ten Katestraat – This popular street market is located in Amsterdam’s Old West district and crosses the famous Kinkerstraat which extends west from the city’s beautiful Canal Belt and Jordaan district. This bustling street market has lots of fresh fruit and vegetables on sale amongst other items and has around 130 stalls. To get there take tram number 7 or 17 to the Ten Katestraat stop. The market is open Monday to Saturday from 09.00 until 17.00. You can read more about the market here, though you may need to translate the page if your Dutch is limited. Dappermarkt – Located in the pretty Dapperbuurt district on the edge of the leafy Plantage neighbourhood to the east of Amsterdam’s city centre, the Dappermarkt was named as one of the top ten markets in the world in the November/December 2007 edition of National Geographic Traveller Magazine. Its incredible selection of delicious Antillean, Turkish, Moroccan and Surinamese cooking ingredients available are likely to be responsible for this award. The multicultural nature of the market makes it a firm favourite with the many international residents of the city as well as the daily visitors. The market is open all year round from Monday to Saturday between 10.00 and 16.30. You can find the market on Dapperstraat. Trams 3,7,9,10 and 14 will take you there easily and you can find out more about the market at their website. Nieuwmarkt – Just a few minutes’ walk from Central Station, the Nieuwmarkt is located in the oldest and most central part of the city. 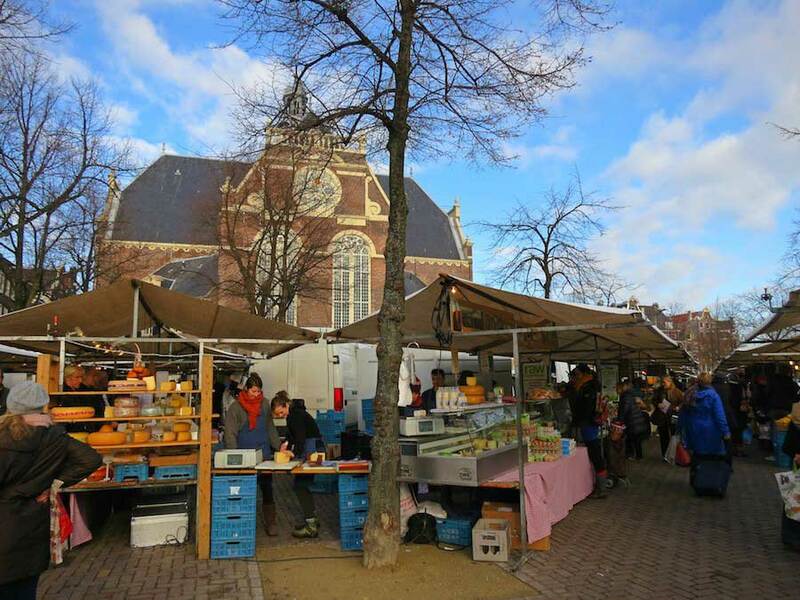 Traditionally markets have been held here on the plaza outside the pretty turreted de Waag building. Whilst various antique and handicraft markets occur during the week, on Saturdays it becomes an excellent farmers’ market selling delicious organic vegetables and fruit. It’s not a very large market but it’s certainly worth a visit and you might pick up some tasty items for a picnic. Noordermarkt – Located in one of the prettiest city central settings nestled in the delightful Canal Belt district of Amsterdam, the Noordemarkt is just a short walk from Central Station. Saturdays see an excellent farmers’ market held here from 9.00 until 17.00 and you can purchase organic fruit and vegetables as well as some delicious cheeses amongst other food items. Off Brouwersgracht, Canal Belt.